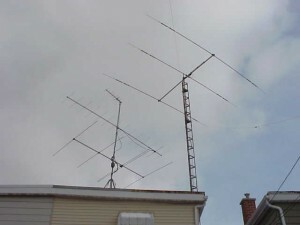 Ham radio operators love chasing “DX” stations. What’s a DX station? Any station that’s far away! What’s considered “DX” changes from band to band. On the HF bands (between 2 and 30 MHz. ), amongst Canadian and U.S. operators, any station outside of North America is generally considered to be “DX”. Parts of the world where there isn’t a lot of ham radio activity are considered “rare DX”. In fact sometimes ham radio operators go on “dxpeditions” just to put a rare part of the world on the air! HF radio propagation is highly dependent on the weather…but not the weather here on planet Earth…but rather the weather on the sun. So, most ham radio operators develop at least a little bit of a side interest in astronomy! The sun has an eleven year sunspot cycle and the last “peak” (Solar Cycle 23) occurred in 2000 with a “smoothed sunspot number” (SSN) of 120. The most spectacular sunspot cycle since records began peaked in 1958 (Solar Cycle 19) with and SSN of 201. Solar Cycle 24, which began in 2008 hit a peak SSN of 75 in November, 2013 and scientists predict that it probably won’t go much beyond that. That will makes it one of the weaker cycles since solar data started being collected in 1755 (Solar Cycle 1). In general, the higher HF bands (20, 17, 15, 12 and 10 meters) work best at the peak of the cycle. The lower HF bands (30,40,80 and 160 meters) tend to propagate best over long distances towards the bottom of the cycle. Of course there are changes from day to day in the solar weather. There can even be solar storms at the bottom of the sunspot cycle. There are seasonal changes as well. So there are alot of variables to take into account! On the VHF/UHF bands, “DX” is any station that’s beyond your normal “groundwave” range. You usually will need some kind of “oddball” radio propagation like “Sporadic-E skip”, tropospheric ducting, meteor scatter, aurora skip etc. to make contact with distant stations. At the peak of the cycle, you’ll find days where the 50 MHz. (six meter) band starts to act like an HF band and will propagate “across the pond” into Europe and elsewhere. What’s one of the best ways to work rare and exotic DX stations? Get on the air during amateur radio contests! There’s a certain “contest effect” that happens on weekends. Operators that are often inactive at other times of the year will get on the air during major contests. As well, many ham radio operators will go on “dxpeditions” during major contests in order to activate areas that are normally inactive.